We at U.C.L.A. hear from reporters a lot, and they are often looking for a few quotes to help write a familiar script. In it, Los Angeles is cast in the role of the nation’s transportation dystopia: a sprawling, smog-choked, auto-obsessed spaghetti bowl of freeways which meander from one bland suburban destination to the next. The heroes of the picture are cities like San Francisco, or especially New York, which are said to have created vastly more livable urban forms based on density and mass transit. But this stereotype is as trite and clichéd as any that has spewed from the printer of the most dim-witted Hollywood hack. And it is just as fictitious. The secret is that Los Angeles doesn’t fit the role it’s been typecast in. I have not yet been granted authorization to distribute the coveted Freakonomics schwag, but challenge yourself with the following quiz anyway. Exactly one of the following statements about transportation in Los Angeles is indisputably true. Two are (at best) half-truths, and the rest are flat-out myths. Can you figure out which of the following is accurate? 1. Los Angeles has developed in a low-density, sprawling pattern. 2. Los Angeles’s air is choked with smog. 3. Angelenos spend more time stuck in traffic than any other drivers in the nation. 4. Thanks to the great distances between far-flung destinations, and perhaps to Angelenos’ famed “love affair” with the car, Angelenos drive considerably more miles than most Americans. 5. 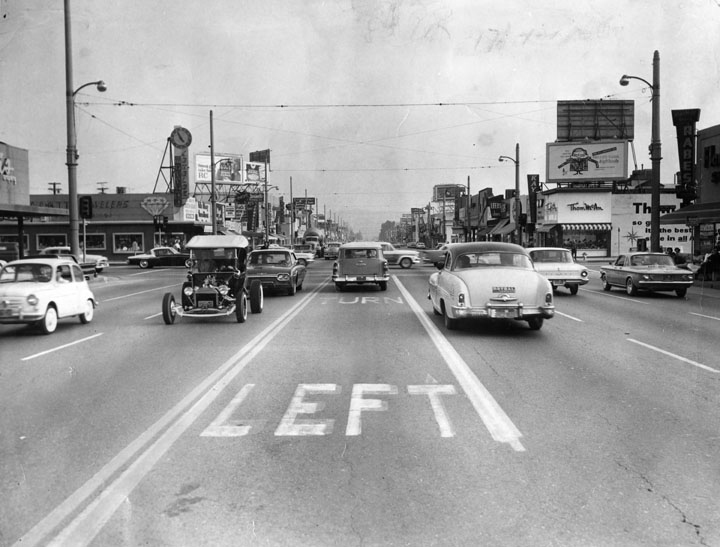 Los Angeles is dominated by an overbuilt freeway system that promotes autodependence. 6. 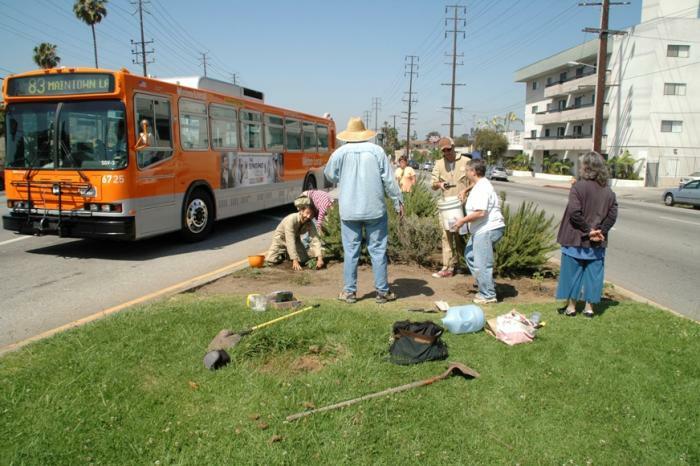 Los Angeles’s mass transit system is underdeveloped and inadequate. Answers to follow over the next few weeks. Comments Off on I’ll Take “Los Angeles Traffic” for $200, Alex. Click here to leave a comment. A traffic engineer I recently heard speaking at a conference said, showing off a new scheme, “there’s a lot you can do with paint.” (Of course, you can also influence human behavior by taking paint away). In any case I thought of that sentiment while recently reading through the excellent catalog (edited by Mirko Zardini and Giovanna Borasi) for an exhibit at the Canadian Center for Architecture called “Actions: What You Can Do With the City,” a kind of surrealist planning guide meets handbook for guerilla civic engagement, filled with ideas, some new, some old — all interesting — about how cities can be made better places to live (and “paint,” it turns out, is one of the categories in the exhibit). 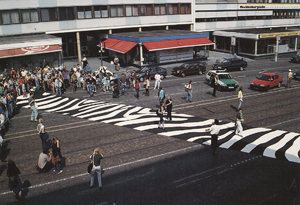 Perhaps not surprisingly, a number of them had to do with traffic, in particular the question of assigning different bits of urban space to different modes, or at least getting us to think about these issues in new and creative ways, rather than simple formulas or prescriptions. I also particularly enjoyed two different kinds of commentaries on the space occupied by the car in the city. 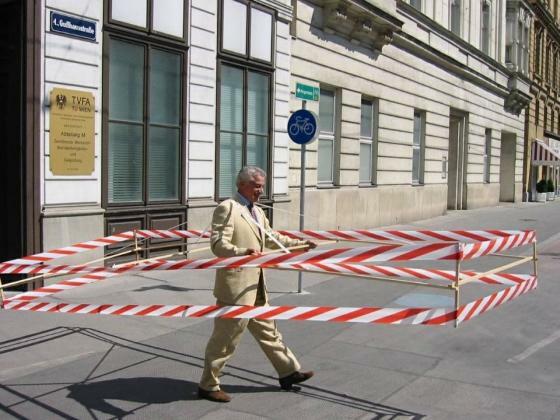 The first, pictured below, is Austrian civil engineer Hermann Knoflacher’s low-tech but effective Gehzeug, or walkmobile, designed in 1975 as a commentary on the “spatial abilities of streets without automobiles. 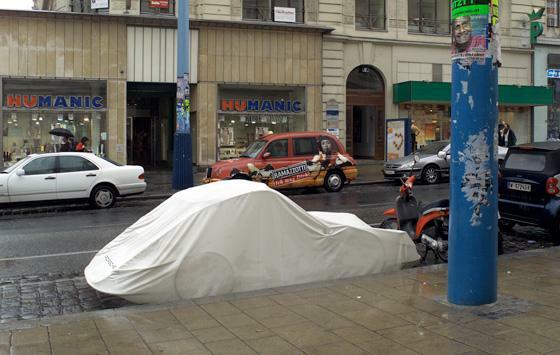 In a slightly different vein is artist Michael Rakowitz’ “(P)LOT Project,” which “restores parking spaces to pedestrians as street-side camping,” using standard car covers. The model below was for a Porsche, and it was stolen. No word on if the tomatoes compromised the sight distance of passing drivers. Comments Off on Actions: What You Can Do With the City. Click here to leave a comment.